Pumper's Premium Stores is happy to have you visit our web site. We hope that it provides you with useful information about our company. 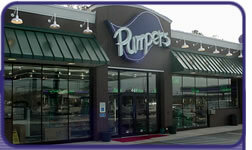 Pumper's prides itself on clean-well lighted stores. Friendly service with a warm hello is the standard we set for ourselves. We know that you have a choice everyday where to purchase your gasoline and convenience items. We strive to earn your business with every transaction. We hope you will plan to visit one of our stores soon. Again thank you for visiting our site and our stores. If you have a suggestion, compliment or complaint, please email me directly with your concern. ©2003-2010 Pumper's Premium Stores, Inc.